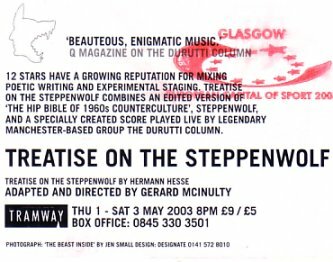 Flyer for the Glasgow Tramway production of 'Treatise on the Steppenwolf' featuring music by The Durutti Column; photograph: 'The Beast Inside' by Jen Small Design: Designate 0141 572 8010. From the flyer: "12 Stars have a growing reputation for mixing poetic writing and experimental staging. Treatise on the Steppenwolf combines an edited version of 'The Hip Bible of 1960s counterculture', Steppenwolf, and a specially created score played live by legendary Manchester-based group The Durutti Column. Treatise on the Steppenwolf by Hermann Hesse. Adapted and directed by Gerard McInulty*"
* perhaps better known in the Factory fraternity as Caesar from the ex-Factory band The Wake. Now this is what Tramway's all about. A young indigenous company, on the margins and with ideas above their station, married to an equally maverick composer-musician and his band for a could-go-either-way adaptation of a Penguin Modern Classics guru. Given such a cast list, it should come as no surprise that 12 Stars, whose founder Gerard McInulty used to play in post Joy Division miserabilists The Wake, haven't so much adapted Hermann Hesse's novel as picked and pecked at it. Playing live, Vini Reilly's Durutti Column provide a series of fragile little guitar patterns to accompany 14 oblique scenes of impressionistic show and tell that fall somewhere between loft-friendly live art and a shy but determined anti-performance. A boy and a girl, all dressed up in last night's glitter and glad rags, promenade an L-shaped catwalk as they unveil the strange story of the eternal man-beast. Both are draped in feather boas, blue and pink as is expected. At the centre of it all, bathed in a glow that's both beatific and rock 'n' roll, Reilly plucks delicately away. Out of such incantations comes a still only half-formed meditation, its linguistic repetitions offsetting the physical stasis, yet still oddly relating more to contemporary dance than anything. Think what choreographer Michael Clark did with The Fall onstage a few years back, then remove the shape-throwing. Nevertheless, there's something haunting about Carolyn Allen and Kenny McGlashan's casual, almost throwaway lack of contrivance, as, egged on by the music's heartbreaking beauty, their rituals work their way towards some kind of higher ground. Die-hards might have preferred it if Reilly, a man born to be mild, had been left to his own devices, uninterrupted by the spoken word. But, like the girl says, it's not for everyone. Well I went on Saturday - arrived somewhat hassled, damp and hungry after several infinities in the vortex of Glasgow's one-way system, and the opening of the heavens the moment we stepped out of the hotel. Still, at least that meant getting a cab rather than trying the walk, as the venue was a lot further than the map made it look. I'm a bit of a Philistine when it comes to theatre, so I treated the thing more as a gig initially, not paying much attention to the theatricality of it, though by the end it had drawn me in. Not there's much in the way of performance, some spoken vocals and a bit of running about, which to my eyes seemed too understated to be as bad as the Scotsman review implied. These vocals worked better with some tracks than others, with a couple towards the end being particularly effective. The show was structured around the music, each track referring somehow to aspects of the book (which I read several years ago, so spent too long trying to remember exactly what). More effective in some parts than others, and I'm not sure whether half-remembering the book helped or hindered. The music was, as we might expect, a mixture of brand new and revisited themes and pieces, covering the full spectrum of Vini's music, from some beautiful guitar-only pieces at the beginning, through to some sample-driven and rock-out stuff towards the end. There was a track listing on the programme, which I'll post if I remember. Stand-outs for me were two tracks which Bruce played extremely loudly on - the second of which was basically Woman from Someone Else's Party, but transformed by a deadpan vocal from the male actor (a similar effect was achieved with a version of Drinking Time behind the female actor's vocal)- and the final track, with a lovely guitar and sample combination. That said, some of the straightforward guitar pieces towards the beginning were pretty magical (Vini was sitting down for a lot of them, so I guess they were complicated). And there was a good one with a sample of a very military voice talking about society and conformity (from a film?). Oh, it was all excellent - it'll be a cracking album when it comes out. A nice touch was the inclusion of the band in the choreography - Keir, and then Laurie Whatever-he-calls-himself-these-days walking on and off to set off sequences etc, Bruce appearing and disappearing several tracks before he was playing. Odd to have no interaction from Vini - no acknowledgement of the audience at all. But then it was odd to have an audience who didn't applaud til the end. Must be a theatre thing I suppose. Said hello to Phil, who seemed to be doing a roaring trade before and after the show. Some people being turned on to the Durutti Column for the first time? He said it's still on the cards to go elsewhere, so I'd definitely recommend it if it turns up nearer anybody who could make it to Glasgow. "THIS is not pop culture, it's not Soft Cell or Yazoo. It's Treatise on the Steppenwolf, and it's not for everybody." These words, spoken early in this co-production between the Glasgow performance company 12 Stars, and Manchester rock legends The Durutti Column, gave a strong sense of what was to come. The lesson of successful collaborations between rock musicians and theatrical or physical performers is that their separate productions have to complement each other both in style and in quality. Fifteen years on, people are still reminiscing about I Am Kurious Orange, the group rock ballet performed by post-punk geniuses The Fall and the Aberdonian dancer Michael Clark. For all the Durutti Column's fine music, however, Treatise on the Steppenwolf manifestly failed to deliver on expectations. This was entirely down to 12 Stars. It is fortunate for the writer and director Gerard McInulty, but Hermann Hesse's work is not as jealously guarded as that of Samuel Beckett. If it were, it would be difficult to imagine him getting away with making such insubstantial work from Hesse's great novel. Carolyn Allen and Kenny McGlashan tried valiantly to inject some life into McInulty's appallingly self-indulgent text and choreography. It was, however, an impossible task. The pretentious repetition of disconnected phrases from the novel rendered them banal. The heavily mannered, self-consciously stylised movements became increasingly bloodless and amateurish. Moreover, far from being complementary elements, the music and performance seemed to be at odds with each other. This was a great pity, because the subtle, often emotive rock music, which is to be released as a CD later this year, was crying out for a more robust, direct performative aspect. Hesse's story of spiritual dualism deserved something better than the almost wilfully antiseptic interpretations brought to it by 12 Stars.